These notes are heavily indebted to Gordon McComb’s Robot Builder’s Bonanza, second edition, which includes some excellent chapters on motors and motor use. When trying to move things with microcontrollers, you’re likely to use one of three kinds of motors: DC motors, RC servomotors, and stepper motors. Following is a brief introduction to these three. In order to get the most out of these notes, you should know something about how electricity works, and you should know the basics of how a microcontroller works as well. You should also understand how transistors are used to control high-current loads. Motors convert electrical energy into mechanical energy so that you can move things in the physical world. They are based on the electrical principle of induction. When you put electric current through a wire, it generates a magnetic field around the wire. The direction of the magnetic field is related to the direction of the electrical current. If there’s a magnet nearby, its field will interact with the wire’s magnetic field. It will either be attracted to the wire’s field, or repelled, depending on the relative orientation of the fields. The higher the current, the greater the magnetic field, and therefore the greater the attraction or repulsion. If you mount magnets on a spinning shaft surrounded by the wire, you have a motor (in the diagram below, the wire is arranged in two coils). As the magnets are alternately attracted to one coil and repulsed by the other, it spins from one to the other, and you get circular motion. The basic mechanism of a DC motor. All inductive loads (like motors, electromagnets, and solenoids) work on this same principle: induce a magnetic field by putting current through a wire, use it to attract or repulse a magnetic body. However, the principle works in reverse as well. When you spin a wire in an existing magnetic field, the field induces a current in the wire. So if you’ve got a motor spinning, and you turn it off, the fact that the motor’s coil is spinning in a magnetic field will generate a current in the wire while it’s spinning. This current comes back in the reverse direction of the current flow you generated to run the motor. When the motor isn’t attached to another source of electricity, you’d call this a generator, because the motor is now generating voltage. When the motor is connected to another source, it’s called back voltage, and it can cause damage to your electronics. Usually it’s stopped by putting a diode in parallel with your motor to stop the back voltage. The rated voltage of a motor is the voltage at which it operates at peak efficiency. Most DC motors can be operated somewhat above or below their range, but it’s best to plan to operate them at their rated voltage. Dropping below rated voltage reduces the motor’s power, and operating above the rated voltage may burn the motor out. Plan on the motor’s top speed being at rated voltage, and slowest speed at no more than 50% less than the rated voltage. Motors draw current depending on the load they’re pulling. Usually more load means more current. Every motor has a stall current, which is the current it draws when it’s stopped by an opposing force. This stall current is much greater than the running current, or current that it draws under no load. Your power supply for a motor should be able to handle the stall current with extra amperage to spare. Motors may draw near the stall current for a brief period of time when starting up, to overcome their inertia. Motor speed is given in revolutions per minute (RPMs). Torque illustrated. This motor can lift a 1 gram weight at a distance of 1 centimeter out from the center of rotation. Therefore, it can supply 1g*cm of torque. Often you’ll see a motor rated in ohms. This just gives you the resistance that the motor’s coil offers. Using Ohm’s Law (voltage = current x resistance), you can calculate the motor’s current draw if you know the rated voltage and the coil resistance. DC motors are usually very fast, often spinning at several thousand revolutions per minute (RPM). For more on DC motor control, see this lab for single-direction control, or this lab for controlling a motor in two directions with an H-Bridge. There are two easily controllable parameters of a DC motor, direction and speed. To control the direction, you reverse the direction of the voltage through the motor. To control the speed, you pulse width modulate it. An H-bridge, at its simplest, is composed of four switches with a load at the center of them. An H-bridge made of transistors. Although you can make your own H-bridges, it’s usually easier to use a controller manufactured specifically for the job. A pre-manufactured H-bridge chip will include diodes to protect the transistors from back voltage, sometimes a current sensing pin to sense the current the motor is drawing, and much more. There are many motor drivers available from various electronics suppliers. Look around to find one that suits your needs and price range. A DC motor’s speed is proportional to the supplied voltage. If the voltage drops too far, the motor won’t get enough power to turn, but within a certain range, usually 50% of the rated voltage, the motor will run at varying speeds. The most effective way to adjust the speed is by using pulsewidth modulation. This means that you pulse the motor on and off at varying rates, to simulate a voltage. Related video: Why use PWM on DC Motors? Gearhead motors are a subset of DC motors. They have a box on the top of the motors containing a series of gears that slow the rotational speed of the motor down and increase the torque. They are useful when you don’t need a lot of speed, but you do need power. They are controlled exactly the same as regular DC motors. For a nice short intro to servos, see the Seattle Robotics page. Servos have three wires to them, unlike most DC and gearhead motors, which have two. The first two in a servo are power and ground, and the third is a digital control line. This third line is used to set the position of a servo. Unlike other DC motors, you do not have to reverse the polarity of a servo’s power connections to reverse its direction. Hobby servos, the kind most often used in small physical computing projects, usually take a pulse of between 1-2 ms every 18-20 ms. They rotate 0 to 180 degrees depending on the pulsewidth. A pulse of 1 ms will turn the motor to 0 degrees; 2 ms will turn it to 180 degrees. A servo needs to see a pulse every 18-20 ms even when it is not turning, to keep it in its current position, so once you’ve moved the motor to a new position, it’s essential to keep pulsing it with the same pulsewidth to keep it there. Stepper motors are different than regular DC motors in that they don’t turn continuously, but move in a series of steps. A stepper motor is a motor that has multiple coils, not just one. By energizing each coil in sequence, you attract the shaft magnets to each coil in the sequence, and you can turn the motor in precise steps, rather than simply rotating continually. This design allows for very precise control of the motor: by proper pulsing, it can be turned in very accurate steps of set degree increments (for example, two-degree increments, half-degree increments, etc.). They are used in printers, disk drives, and other devices where precise positioning of the motor is necessary. Steppers usually move much slower than DC motors, since there is an upper limit to how fast you can step them (5-600 pulses per second, typically. 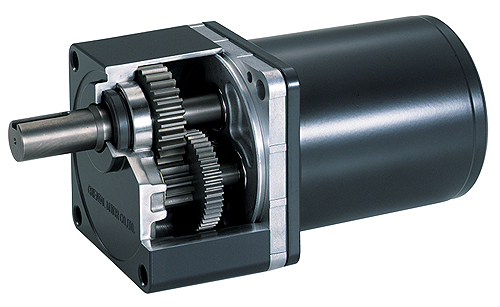 However, unlike DC motors, steppers often provide more torque at lower speeds. They can be very useful for moving a precise distance. Furthermore, stepper motors have very high torque when stopped, since the motor windings are holding the motor in place like a brake. To control a stepper, you use stepper driver that will energize the coils in the right order to make the motor move forward. There are plenty of libraries and driver modules and ICs that simplify the process. What follows is a low-level explanation of how steppers work. Schematic drawing of a unipolar stepper motor. If the resistance between 5 and any of the others is X ohms, then the resistance between any of the other pairs (e.g. 2 to 4, 3 to 4, etc.) is 2X ohms. Schematic drawing for two bipolar stepper motors. In both cases, if the resistance between the ends of either coils is X ohms, then the resistance between either end and the middle of a coil is 0.5X ohms. To power each coil, you supply voltage one side of the coil while grounding the other side. Typically, you drive a stepper motor with an H-bridge or an array of power transistors or MOSFETS. Once you have the motor stepping in one direction, stepping in the other direction is simply a matter of doing the steps in reverse order. Knowing the position is a matter of knowing how many degrees per step, and counting the steps and multiplying by that many degrees. So for examples, if you have a 2-degree stepper, and it’s turned 180 steps, then it’s turned 2 x 180 degrees, or 360 degrees, or one full revolution. For more on stepper control, see the notes on stepper motor control and this Lab: Controlling a Stepper Motor With an H-Bridge. For a more technical discussion of stepper motor control, see Control Of Stepping Motors, a tutorial, by Douglas W. Jones. Another good tutorial on steppers is at Ian Harries’ site.